Shortly after the loss of Father, Mother elected to endure double knee replacement surgery. Mother had cared for Father in his final years, and now she intended to enjoy her remaining years with the new mobility offered by replacement knees. The replacement surgery went without problems, but afterward Mother struggled to wake up. By the next day it was apparent that Mother was in a drug-induced coma. For 11 days, the family relied on one another for strength until the call came from my sister that Mother had emerged from her coma. Living nine hundred miles from Mother’s hospital, visiting for more than a weekend was difficult. 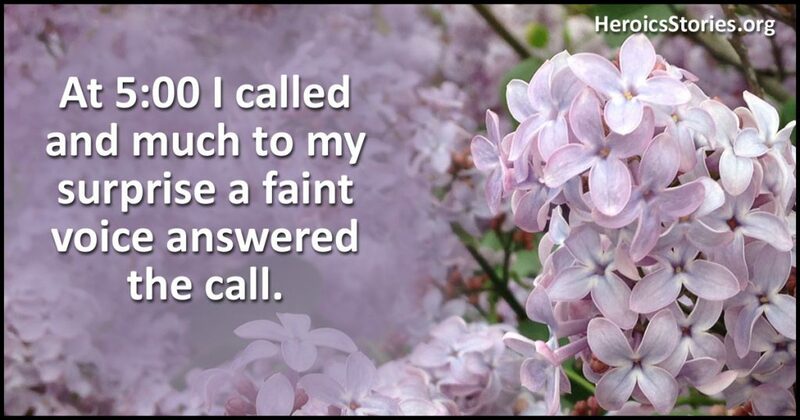 One Saturday I received a call from my sister that Mother was asking for me and if I could call at 5:00 p.m., I would be able to speak with Mother. “Do you have Mom’s telephone number?” Yes, I replied, but why don’t you give it to me anyway? Mom, do they still have part of that trachea attachment in your throat? Your voice seems a little different. “I’m not sure,” she replied. I thought this seemed odd. Surely Mother must feel the oxygen tube that gets connected to her throat while she sleeps. Mom, how do your knees feel? “My knees? I guess they’re okay.” Hearing this I decided that it was time to wrap up our conversation.